The Trey Anastasio Band have announced their first full-band headline performances in nearly two years. The dates kick off May 28 in St. Petersburg, Florida, and wrap June 1 in Atlanta. 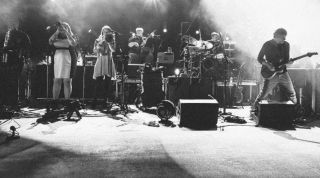 The band—which, in addition to the Phish frontman features Tony Markellis (bass), Ray Paczkowski (keys), Jennifer Hartswick (trumpet, vocals), Natalie Cressman (trombone, vocals), James Casey (saxophones, vocals), Cyro Baptista (percussion), and Russ Lawton (drums)—will also perform at the upcoming Peach Music Festival, slated for July 25-28 at Scranton, PA’s Montage Mountain. Pre-sales begin Tuesday, February 12 at 12 PM EST and continues through Thursday, February 14 at 5 PM ET exclusively via Trey Tickets. All remaining tickets will go on sale to the general public on Friday, February 15th at 11 AM EST. For all Trey Anastasio Band tour dates, see below.